Hello! If you are arriving from Fran's blog as part of CM's Blog Hop featuring the ever popular Custom Cutting System, you are in the right place! If this is your first time visiting my blog, welcome! I'm Noreen and I'm the newest Creative Memories Content Contributor! I am so excited to be able to share ideas, tips and tricks using my favorite CM products and feel very honored to be part of such a talented group. My dearest hope is that even one reader will find inspiration in some of the projects I post. I began scrapbooking shortly after getting married. Like many of you, I attended a Creative Memories Home Class where we were instructed to bring a few photos and we were given strips, triangles and sticker squares to complete a page right on the spot. I was hooked! I became a Creative Memories Consultant a short time later and had a great time for many years hosting crops and retreats, helping people preserve their memories and tell their stories, and having lots of creative fun along the way. I was so sad when the former Creative Memories went out of business, but was elated when Caleb Hayhoe bought the company last year and brought back the products we all love! Now, the new CM company has also been able to bring back the "Circles" and "Ovals" templates for us to use with the Custom Cutting System and I was thrilled to be able to use them for today's post. 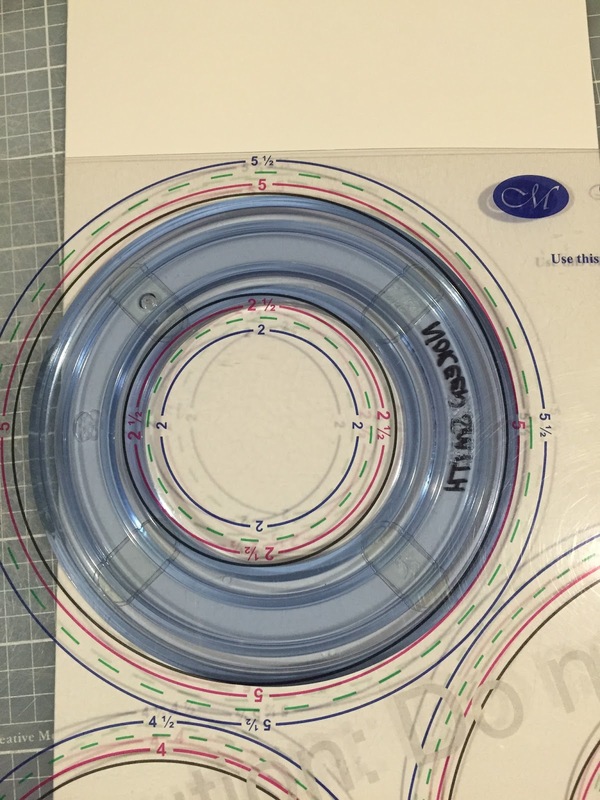 If you have never used the Custom Cutting System (CCS) you will be thrilled to see how quickly and easily you can create nesting circle and oval shapes. They are perfect for matting photos or creating journal boxes, and I know that the other Content Contributors are showing super cute and creative uses for them on their blogs! 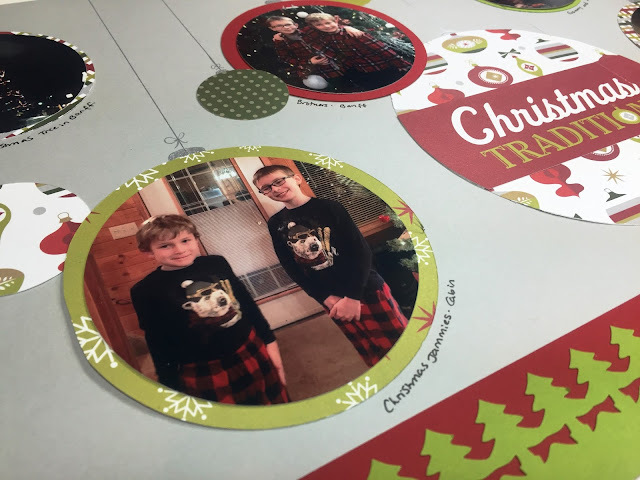 The clear templates allow you place the circle or oval directly on top of the paper or photo you want to cut out so you can see in advance exactly what you will end up with. The ergonomic handles on the cutting blades work like a charm and eliminate any awkward wrist-twisting! 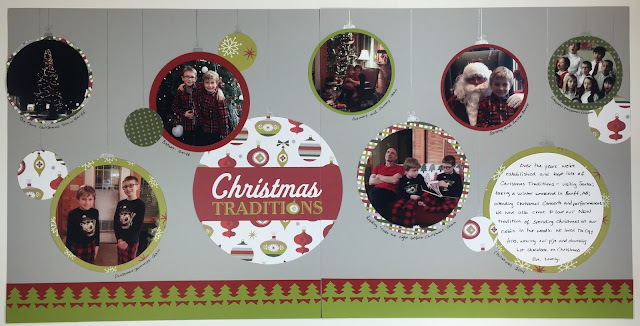 I'm am in such a Christmas frame of mind right now and am enjoying working with the Christmas Joy products, so for this Blog Hop I knew I wanted to create a two page Christmas-sy layout using the CCS Circles. The circle patterns (and the patterned paper!) reminded me of Christmas ornaments, so I thought I would stagger many different sized circles across my layout as if they were ornaments dangling from a tree. Cut a variety of sizes of circles from the Christmas Joy patterned papers and started arranging them across the two pages. I like to make sure some elements span the two pages so the layout looks like a cohesive. I finally settled on one large circle for the title, one for a journal box, seven mid-size circles for photo mats and few more as small accents. Cut a 4.5 inch circle of white cardstock and mounted it on a 5 inch circle to use as a journaling box. Choose a 4 x 6 Slide-In Card with text in the horizontal orientation to use as the title. (I chose the "Christmas Traditions" card.) Trim it down to a 2 x 6 inch strip using the 12- inch Straight Trimmer. Mount the strip across the middle of the large circle and trim off the excess that overhangs the edges with All-Purpose Scissors. Adhere all the photos/circles on to the layout, staggering them across the page. 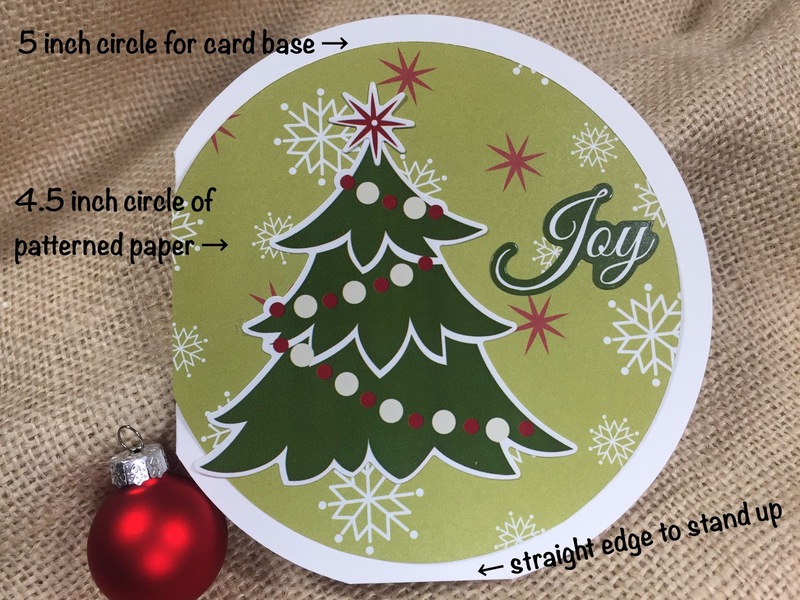 Use a Silver Metallic Pen to draw a simple rounded rectangle at the top of each circle (like the hanger on an ornament) and then draw a straight line to the top of the page to give the illusion of a hanging cord. Finish with a little sideways "8" drawn by hand to serve as a bow. For the bottom border: Cut two 1.5 inch strips of red cardstock and adhere one strip to the bottom of each page. Punch two 12 inch rows of evergreen trees from green cardstock with the Evergreen Border Punch and Border Maker System. Adhere the trees over the red cardstock strips. Finish off the layout by journaling with a Black Dual-Tip Pen and adding captions or details underneath each of the photos. My journaling is, as the layout's title suggests, about our family Christmas Traditions. While I had my CCS Circles and Christmas Joy products out, I thought I would try to create a circular card, too. Fold an 8.5 x 11 piece of white cardstock in half. Place the medium size template so that it overlaps over the edge with the fold. Cut the circle with the red blade to create a 5 inch circle. Trim a small straight edge along the bottom of the circle with scissors so the card will stand on its own. Cut a piece of patterned paper to 4.5 inches and adhere. Trim off any paper that overhangs the edge of the card that has the fold. Add another layer of paper, a border or any other decorative elements you like. 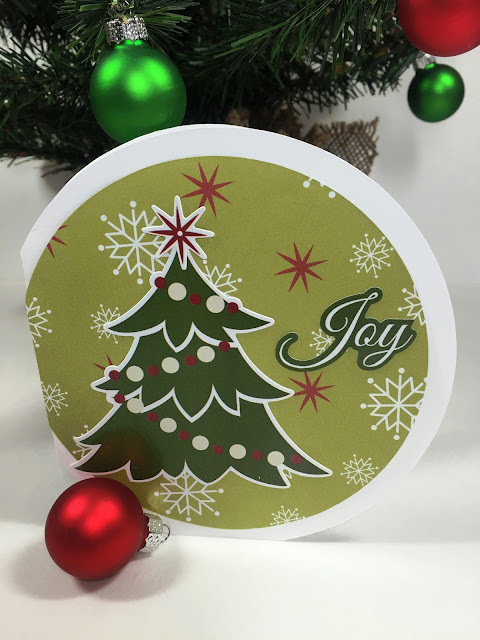 I used the Christmas Tree and the Joy sticker from the Christmas Joy Stickers pack for an easy, quick and cute embellishment. Hopefully my projects today inspired you to go get out your Custom Cutting System or purchase one of your own to try! I know it had always been a popular tool at my crops and retreats. And don't miss all the other creative ideas being shared today on the Blog Hop by the incredible Content Contributors! So whether you arrived at my blog via Fran's Blog or this is your first stop on the Hop, make sure to visit them all. If you're going in order, next up is Candace's Blog, then home to the Creative Memories Blog*. Stop #6 - My Blog...you are here! * No matter which order you visit the Blogs, make sure you finish up at the Creative Memories Blog for a chance to win a fabulous CCS bundle - including the Jumbo Hexagon Template, a set of Three Cutting Blades, a Cutting Mat PLUS the Circles and Ovals Templates! The prizewinner will be chosen at random from the comments on the Creative Memories Blog that share something they loved throughout the Hop.Good luck! 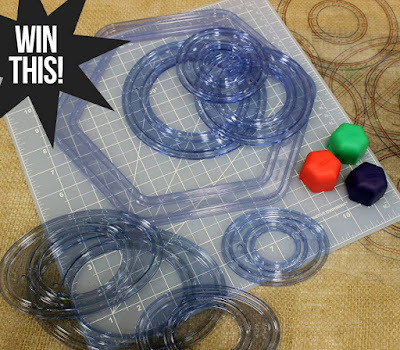 Before you leave, I'd love to have you leave your comments below about what projects YOU would create using the Custom Cutting System or any questions you may have about using it. I love the Circle Ornaments. Love the simple 2-page spread! They're all fantastic ideas!! I love the ornaments and how you wrote around them! Thanks for sharing!! I like the ornaments! 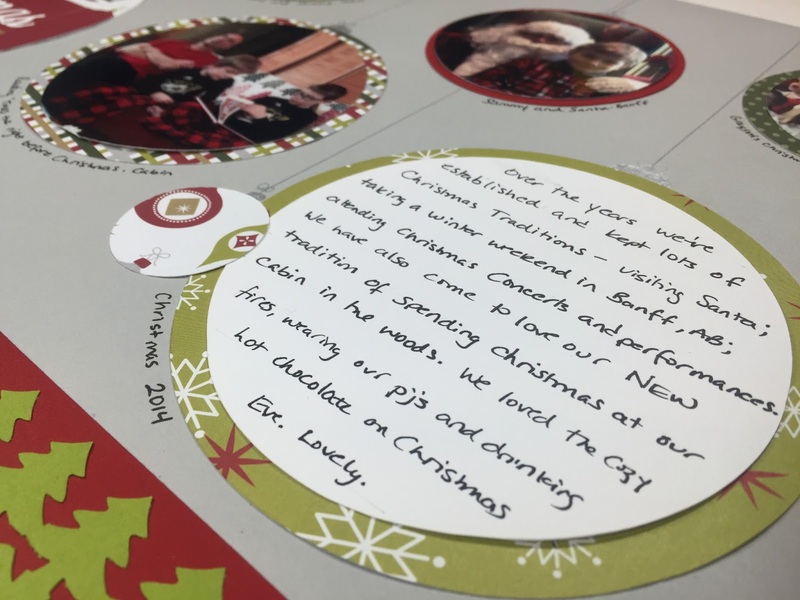 It would be a fun way to reuse Christmas cards from the past! I love the card.Thanks for sharing. Great 2-page spread and fun card! Love how you split the Christmas Traditions ornament between the 2 pages and created the silver metallic hangers on the ornaments. The "ornaments" are adorable! I've never thought of that!! Thank you for sharing!